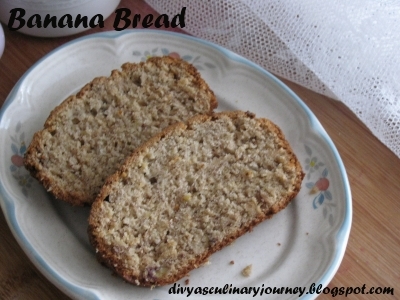 ...my favorite quickbread...Banana Bread is always delicious!!! Nice texture and bread looks moist. Banana is not one of my favorite fruits, hence won't comment about the recipe. my fav bread...Perfect to have with coffee...Glad to meet u in BM. Surely looks very professional!.. :)..good to have you run the BM with us..
Aromatic Bread!!! !Make them more often and that too after a festival, coz we will be having a lot of banana left over!!!!! looks great n I like that pretty plate there..tell me can we make it eggless? With nutella spread, i can have this banana bread anytime of the day..Well baked.. Very nice, looks soft and yummy..
looks good. I make the eggless version !